ATM's Stepper Option offers finer phase adjustment when compared to any other form of automated shaft control. With a resolution of less than 0.02° phase shift per step @ 1 GHz (or less than 0.35° phase shift per step @ 18GHz) this option offers the most accuracy when controlling one of ATM's phaseshifters. ATM's 2-phase stepper motor drive can easily be programmed to Increase Phase, or Decrease Phase. 180 RPM max suggested directly coupled to any ATM device in order to prevent damage. Suggested Input Power is 24 to 48 VDC. 1.5A (ATM supplies a 24 VDC Power supply when the MCSM-003 is ordered). An internal encoder standard on all models allows finer traceability. See connector pinout for details. Units are mounted with male 9-pin D-subminiature (DE-9M) connector for stepper motor power/control. Refer to D-sub pinout diagram for detail. The model above "P1407-SM24" is just one example. The model number for your stepper motor-driven phaseshifter should be tailored according to base phaseshifter model, and desired options. see Coaxial Phaseshifters. 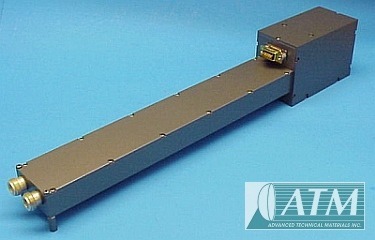 For more model choices, see Coaxial Phaseshifters. (ATM P/N: MCSM-003) Designed to operate all of ATM's stepper motor-driven phaseshifters and attenuators. 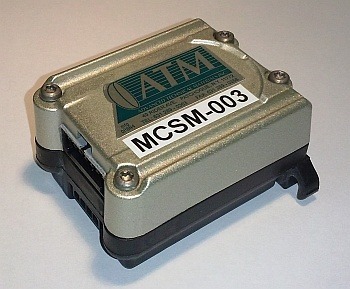 What is supplied with ATM's MCSM-003? USB drive (see below for details). USB to Micro USB cable, Cable A.
RS-422-485 ribbon cable, Cable B. 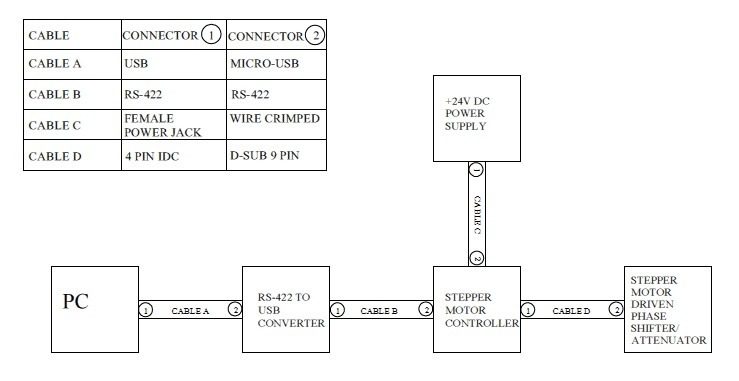 Power cable, power jack to wire connector, Cable C.
ATM test program--this is a short program that should be used to verify that you have installed the software correctly, and that everything is appropriately connected. General Instruction--this will walk you through how to install the control software, as well as how to run the ATM test program. Command Instruction--This outlines how to lay out your own program. This also illustrates the basic instructions you need to know in order to write your own proram. IMS Terminal--The software used to control the stepper motor. This will come in a 32 bit and 64 bit version.